Lawry Thorn Class - we are no longer taking students, class is full! This class is now full! We are so excited to have Lawry come and teach a class here - her mystery classes are always popular at Sisters! For this class you will have the choice of two different quilts you can make - a star with flying geese, or a quilt with pinwheels. Pam Boatright designed this beautiful medallion quilt for Island Batik and will be offering this as a two day class. On day 1 she will teach you how to make the striking feathered star center with no y seams, Day 2 will concentrate on the borders. 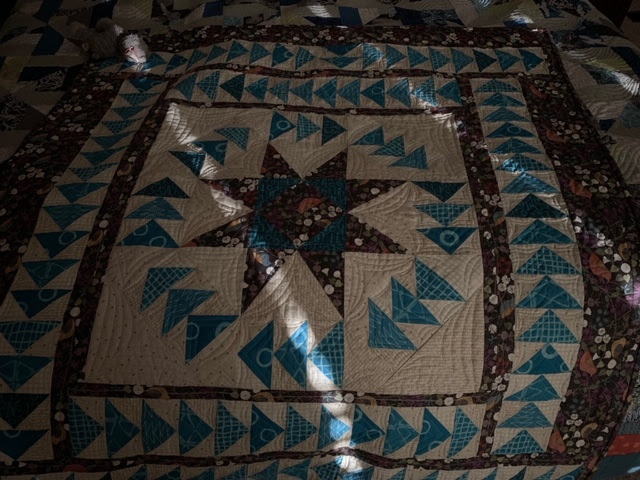 There is a foundation paper piecing option for the feathered star triangle units, but this quilt can be completely pieced using traditional methods. Buy the kit available in these colors for $118, or the pattern can be purchased separately and you can choose your own colors. Class size is limited to 8 students. Stop by or call the shop to sign up. (541) 267-0749. Diana Yaeger will be teaching this fun Bargello Table Runner. The cost of the pattern is included. Bring your own lunch. This runner can be made in various sizes to suit your fabric. You will need to precut your Bargello strata and sew together before class. We only have a few openings left, so sign up now! This project is quilt-as-you-go, so when you are done sewing, your project will be finished! Class size limited. Stop by or call the shop to sign up. (541) 267-0749. Two-Color Applique Class, "Just Desserts"
We have scheduled Connie Sayler from Pacific Rim Quilt designs to come teach a two-color applique class. Click here for more details. Ruthe G. is teaching this class on February 2. Come see the pretty sample we have made out of cork fabric - so awesome! Click here for more details. Taught by Dawn. This is a quick and easy bag that makes great use of precuts. Click here for more details. Taught by Pam Boatright. This is a two part class, lots of sewing, but not difficult. Plan for lots of sewing, chatting, and a fun time as we put together our rugs! Click here for more details. We still have room in our "Cactus Flower Table Runner" class for more students. This is the perfect class to learn or expand on your foundation paper piecing skills! There is some prep involved, so you need to sign up soon to get everything ready. Click here for more details. Cheryl will be coming to teach this beautiful project on October 20. Class is $50.00 and includes the pattern and your lunch! You won't finish the quilt in one day, but Cheryl will teach you all the techniques that go into making this beauty of a quilt. 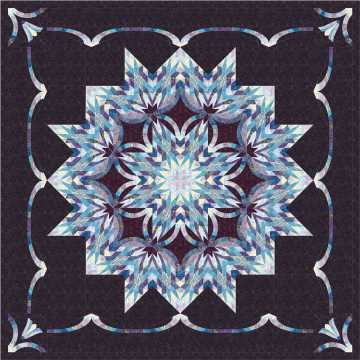 Employs freezer paper piecing, with options for hand or machine piecing, and machine applique. The class will start at 9:30 and go to 3:30 and will be held at the Elks club. Stop by or call the shop to sign up. (541) 267-0749. Note: If you can't attend the class, we also have Cheryl's pattern available for sale on its own. Are you already addicted to scraps, or do you just want want to learn how to use them? Melinda Andrews is teaching a series of four classes focused on Scappy projects and using Bonnie Hunter's scrap users system. Tame that scrap bin and have a great time creating colorful and unique quilts from units and spare parts! $60.00 for four sessions - September 25, October 9, October 23, and November 6 from 5:00 p.m. to 9:00 p.m. If you know Melinda, you know that you will not only learn a lot, but you will have a great time as well! Come and get yourself addicted to scraps, too! Stop by or call the shop to sign up. (541) 267-0749.